I can't even express how much this little guy has me wrapped around his tiny fingers. He's so adorable and fun and happy. I just want to hug and kiss him all the time. I love making him laugh and seeing his big, slobbery, almost-toothless grin. I'm trying to enjoy this time as much as I can, where he is just so dependent on me and when he sees me his whole face lights up. He makes my heart happy. So, one thing I haven't updated on in a looong time is my garden. Last year I started my garden blog and updated it every few weeks with pics. This year, not so much. It's doing ok. I decided not to try corn this year, and a few other things. I planted tomatoes, green peppers, peas, potatoes, lettuce, and radishes. The lettuce and most of the radishes got destroyed the first few weeks from Jakey digging in the garden. The first 4 tomato plants got eaten to pieces by birds so I had to plant more and put some netting around them to keep the birds away, and they are growing ok. I actually had one tomato starting to grow but Jakey reached in and pulled it off. The peas are growing great, but the boys keep picking the pods off before they are done lol. The potatoes are growing like crazy, but who knows if there will actually be many potatoes. Last year I only had about 6 even though the plants grew a ton. And we did get some strawberries this year, but the birds kept eating them as soon as they were ripe. The flowers also got ripped up by the birds and only a few have survived. One of the hosta plants I planted last year actually popped up this year, to my surprise, but it's been eaten by bugs a ton and hasn't grown very big. The front flower bed is doing great though, tons of flowers all over. Hopefully by the end of the growing season I can update on the yummy tomatoes and peas and potatoes I get :) Homegrown veggies are so much yummier. Yesterday our church's primary did a patriotic parade to celebrate the 4th of July. It was a lot of fun. We decorated the boys and their bikes and joined them for a ride around the block. Afterwards we ate hot dogs and chips and lemonade. It was really fun for the kids. Aren't they just adorable?! I love my cuties. Here are a bunch of pics from our day at Lagoon. If it looks like it was freezing cold and rainy, that's because it was. Brr! But the boys had a blast and we got lots of pictures of them on the rides. We finally were so cold and wet that I told Hubby we needed to leave. While shivering uncontrollably and walking for hours may be good fatburners, they aren't so good for arthritic joints. I was so achey and chilled to the bone by the time we got home I had to go take a nice hot bath. But it was still a fun day and the boys really enjoyed "The Goon" as they call it lol. Ever since we got rid of our satellite service, I've hardly watched TV at all. I mostly watched HGTV and DIY during the day and dreamed about designing my kitchen with granite countertops and Kohler faucets and stuff. But not anymore. Instead we've been playing our Wii a lot more. Mostly MarioKart. Jason is actually getting a lot better at it. Before he would just drive into walls and around in circles endlessly, but now he can actually finish a race, and he isn't always last. 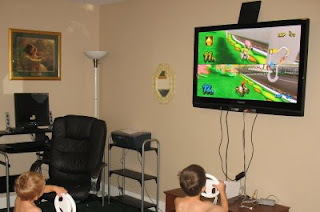 We also downloaded some of our old favorite games like Super Mario World and Zelda and it's just been a lot of fun to play with the boys and our family and friends. I just had to post this pic, of Nathan on the slide at a playground, because he is just the cutest thing ever! I could just eat him up. :) What I really love about the pic is how the shadow on the slide behind him looks like a halo. It's just perfect on him. He's the sweetest little baby ever. So, a few weekends ago I ran my 5k, like I posted before. And I haven't run at all since then. Not because I don't want to (well, maybe a little bit) but mostly because I never have the time or energy. This last week, there has been something every single day that's kept me from running. I'm going to try harder to get out this week. I have to. I have a 10k in less than 3 months and I am not at all ready! Anyway, here I am in all my sweaty about-to-throw-up glory. No, I didn't actually throw up, but almost. I don't know why races do that to me. I never have that problem when I run my normal workout, but by the end of a race I'm fighting not to puke. Hopefully I don't after my 10k. I think I might try working out with Hubby's ipod again, find a nice beat to run to. A lot of the other runners I saw used ipods, and I was reading a running messageboard about music to run to and how it can help you keep a steady pace so you don't wear yourself out too soon. So far what I've been doing is just singing "Eye of the tiger" in my head throughout my runs lol. Corny, but it does help. Oh, I almost forgot the funniest part about my 5k. As I neared the finish line my family was waiting for me. Jakey saw me and yelled, "Mommy!" and ran up to me lol. I had to keep going and Hubby tells me Jakey had the most confused look on his face that I just ran away from him lol. The other spectators thought it was pretty funny that he ran out to me lol. My brother and SIL bought Jakey some Lincoln Logs for his birthday. Unfortunately Jakey was only wearing underwear when he opened the present so I'm not going to show you those pics lol, but instead you can see who actually spends more time playing with them- Jason. Jason's the builder in our family, Jakey's the deconstructor lol. That reminds me of a toy my siblings and I used to play with. They were these big waffle blocks that we built tons of stuff with. Hm, can't remember what they were called, but I don't think they sell them anymore. I'm going to look up what they were. Oh, guess they actually were called waffle blocks. They were made by Little Tikes, and they sell mini ones still, but the giant ones were awesome. I bet I could find them on ebay or something, but they probably cost a bunch. I love that you can find just about anything online and pay for it with PayPal or Total Merchant Services or whatever. Hm, sorry I keep rambling. LOL I'm just tired and my mind doesn't know when to shut up when I get going about something. I still have plenty of pics to go through to. OK, done with yummy dinner. Crock-pot barbecue chicken, mmmm. I love making chicken in the crock-pot because it gets so nice and tender and falls off the bone. Jason says barbecue chicken is his favorite lol. Usually the boys just pick at their meat and only eat a few bites, but Jason scarfed his right down. We are still trying to get Jakey to eat his dinner. He's being a stinker about it. The only thing I don't like about using the crock-pot is that it takes up the whole sink to soak and wash it. Makes me wish I had one of those huge farmhouse sinks I see on HGTV. I could fit all my dishes in there with ease. Of course that would probably cause them to pile up more before I got around to washing, so I guess it's good my sink isn't that big lol. Alright, back to the pics! OK, time to take a little break and see if dinner is ready. I didn't realize how much time it would take me to go through the last 2 months of pics and find the ones I want to post. Don't worry I still have plenty to come lol. I have tons from Lagoon last week, so that post alone will take me some time. And dinner just smells too yummy to wait any longer lol, so I am going to eat first. Alrighty, here are a few pics of Jakey opening presents at his birthday party. He turned 3 on June 1, and we had his party the following Saturday. We had a ton of people show up and we ate and had a great time. Ugh, well evidently most of the pics of him opening presents have me looking absolutely disgusting in them so I won't subject you to more than those 2 lol. And here is a pic of him eating his little cake. :) I made cupcakes for everyone else. (and I only ate 1. Or 2. Or maybe 3. OK, I'm not sure how many I ate, but who can eat just 1 cupcake?! At least I have a good metabolism or I'd need to get the best diet pills available to counteract all the sugar I consume on a daily basis. Anyway, back to the post.) I tried to add a video of us singing Happy Birthday and him blowing out the candle, but it's not working. I probably did something wrong lol. 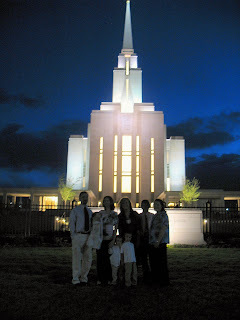 We went to the Oquirrh Mountain Temple Open House a few weeks ago when the inlaws where down here for Jakey's birthday. I love going to the temple open houses and seeing the inside of the beautiful temples with the boys. This one is really special because it is the new temple for our area, so we will be going to it most of the time now. I'm really excited. One fun part of evening was the little golf cart things that we got to ride from the makeshift parking lot to the temple and back lol. Fun as in 'I don't know if I want to laugh or throw up' lol. I had a death grip on the side of the cart, while holding baby in the sling. Who needs diet supplements when you get to purge yourself from a ride in the death cart? haha. It actually wasn't that bad, I just was feeling kind of dizzy and sick that day anyway (no, I'm not pregnant! LOL just a pinched nerve in my neck. Yes, one of these days I'll go see my chiro about it.) and the fact that the refreshment tent afterwards was on a slight hill and was messing with my sense of balance. OK, next up, birthday party pics! OK, I'm going to start with this cute pic. Jakey is just so cute with Nathan. In this picture he was reading books to Nathan. We actually have a video, but I didn't feel like editing and cutting to put it on here lol. But it was adorable. Yep, that is a giant bug he is looking at. We have these books "What's Inside..." different things, and this one is about what's inside insects. I don't know why anyone would want to see what is in an insect, but Jakey for some reason likes the book lol. Of course Nathan doesn't care what it's about, it could be about gay vacations and he wouldn't know the difference. He just enjoys the attention Jakey gives him. Today I've decided it's time to catch up on a few months worth of pictures that I haven't uploaded from my camera yet. We've got birthday party pics, Lagoon pics, and cute baby pics. So I'll be posting a bunch today to try to get caught up. I'm not even sure what pics I posted last, I need to go check, but I know it's been a while. Ugh, I know I've gotten really awful about blogging lately. I just have not been in the mood at all. I'm super behind on posting pics in my boys' pic blogs too, I haven't even been taking many pics. It's been a busy week. Last week one of my brothers moved in with us. It's been going pretty well, just getting used to another mouth to feed lol. Saturday we went to Lagoon (local amusement park). Unfortunately it was cold and rainy the whole day, so I didn't really enjoy it much but the boys had a blast. Even Nathan was good the whole time. For Father's Day I ended up having a little party with family. I made delicious lasagna and we all sat around making fun of the first season of Star Trek: TNG that I got Hubby for Father's Day. So cheesy! It was a fun day. Monday I had a light treatment, Tuesday I had an orthodontist appointment (that I have to drive 2 hrs away for) and scouts, today I luckily have nothing, tomorrow I have another light treatment and need to go help the lady in our ward with MS do some cleaning at some point, Friday I'm taking my sister to an appointment, and Saturday we have a primary kids activity and 2 birthday parties. Plus I watch Little D still 2-3 days a week. I really miss back in the day when I didn't have so much on my calendar lol. I've also had a bad headache for about a week. I even took prescription Ibuprofen and it barely helped. I know it's just because I need to go see the chiropractor, my back and neck are all out of wack, but I just can't get around to it with everything else I do lol. Today on our way home, through off and on downpour, I was enjoying watching the scenery. I love the sky and seeing different clouds and how the sun shines down through the breaks in clouds to light up the mountains. And then as we passed out from under the giant storm front, I looked back from our sunny spot at the billowing dark clouds and rain behind us and it was so cool looking. I also liked seeing the old worn out wood and steel buildings, the ancient barns and outhouses that look like they will fall over at the smallest breeze but manage to stay standing. Makes me really wish I was a great photographer so I could get some cool pictures. I tried to get some nice sunset pictures on our way up Friday, but they kept coming out fuzzy. So, this morning I ran a 5k. My friend Michelle had warned me that there was a big hill but I did not realize just how big it would be. And it was colder than I'm used to running in. So between this giant hill and the cold air I was exhausted before I'd even gone a mile. I ended up walking most of the hill. Luckily the last mile is going back downhill and that was much easier. I would have liked to have a better time, but I figure with the hill and cold I still did ok. I placed 11th in my division with a time of 36:56. Some days I'm not sure if running to get fit is worth it, it would be much easier to check out diet and slimming pills reviews and go that route lol. I do enjoy running though. Most days. When it's not too hot or too cold, and there aren't giant hills lol. I am signed up to run a 10k in 3 months and luckily that course is much easier, I just have to increase my stamina. Does anyone else feel like this year is going by incredibly fast? I can't believe it's already almost half gone. I think it's because life just keeps getting busier all the time. There used to be a time when I would have nothing at all on my calendar, but now practically every day there is something. Plus, of course, just the business of taking care of the kids and house. Today I have a UVB appointment again, and that's it. It would be nice to get to go running but I can't be outside on the days I do my UVB, plus with the on and off rain, I probably couldn't anyway. Tomorrow I have a cub committee meeting in the morning and a Lia Sophia party in the evening. If the weather cooperates I might get to go running before the party, but we'll have to see. Not many people have RSVPd for it, but hopefully at least my mom and sisters will come, and Little D's mom is planning to come at least. And maybe my SIL. We were looking through the catalog a few days ago and she was telling me she wants to do a purse party soon. I've never been to one of those, I don't know if they are wholesale handbags or designer purses or what, but it sounds fun. Friday we are heading up to Idaho and will be back Sunday night. Ugh, teething baby is awake again. He has been sleeping horrible, and not napping more than 30mins at a time. I'm going to get him calmed down and then go make me some brownies! * Jacob turned 3 a week ago! (I know, how could I not blog that?!) I don't know if I've mentioned it, but he's potty trained now, which is heaven! It was so much easier than Jason was. We had his birthday party on Saturday and it was a blast. Lots of friends and family came and he enjoyed getting showered with attention, and gifts lol. 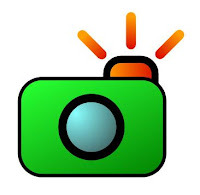 I have some pictures, but haven't uploaded them yet, but I will TRY to post some in the near future. * Jason broke a basement window on Jacob's birthday. He pushed their ride-on car thing into the window well and it busted the outer pane of the window. He was grounded the rest of the week and all their outdoor toys were confiscated and put in the shed. * Jason and Jakey are spending the week in Idaho with the inlaws. It's nice to have a break, the house is quiet and I can get some cleaning done and it STAYS CLEAN! So nice. I do miss them though. :) Another nice thing is being able to enjoy some one on one time with Nathan. He's such a fun, cute little boy but I don't get enough to enjoy his baby stage normally, and I don't want to miss it. So that has been fun. * We took the boys to see UP a few weeks ago and it was really good. I'm sure we'll be buying it when it comes out. A great family show and the boys did really good at the theater. * Nathan got his first tooth on Friday. He's been grumpy for a week, and we're still waiting for #2 to pop through. Hopefully it'll come through soon because he has been sleeping worse than normal. * Jakey and Nathan had well-child checks on Friday. Both doing good. Nathan weighed in at 17lb 14.5oz and 26.25" (I think, I didn't write the measurements down). And Jakey was 27lb and a little over 36" (I really don't think those height measurements are right, and it's annoying me that I didn't write it down lol). Nathan got 3 shots and Jakey got 1. I also had Jason and Little D with me, and let me tell you, taking 4 little kids to a Dr office is NOT fun! * This Saturday I am running a 5k. We are going up to Idaho Friday night, and the race is in Rexburg Saturday morning. And the only day I can run this week to practice is today. I hope I do good. * I started light treatments for my psoriasis last week. I get to stand in a big UV booth and get blasted with intense UVB rays for a short time. This should finally get my psoriasis cleared up, plus I'll be nice and tan. I've only done it twice so far (I go twice a week) and I'm already getting tan lines. Downside- higher risk of getting skin cancer. Goody. OK, I think that's my life in a nutshell! Cute little baby thinks he needs to eat again so I'm going to go cuddle him a bit.